In this debut upper middle–grade mystery, several outcast students at a charter school search for their missing teacher. Twelve-year-old Oliver Teller lives in Raven Ridge, Colorado. His mother works two jobs to keep him attending Raven Ridge Academy, a castlelike school situated above an old silver mine. Oliver has a large birthmark on the right side of his face, making him a target for bullies like Johnny Ricker. He also has a friend named Gio and harbors a crush on the clever Jaclyn Jones. Hoping to start the new school year right—and impress his teacher, Mr. Doyle—Oliver brings his great-grandfather’s pocket watch to history class. When Johnny steals the watch from Oliver, Mr. Doyle confiscates it until after school. Enter Chase Sullivan, new student and self-styled detective, who promises to get the watch back. Luckily, Chase’s specialty is the paranormal. The academy is home to gargoyles, ghostly students, mysterious power surges, and a teaching staff whose conversations seem to point to a conspiracy. 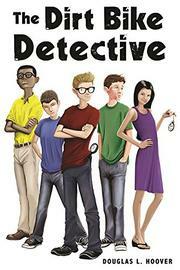 When Mr. Doyle goes missing, the young detectives explore every possible explanation, from aliens to zombies. They must act quickly because the U.S. president is coming to honor their classmate Ana Rahela Balenovic, who wrote an award-winning essay on her pride in America. Hoover presents a sprawling world populated by charming heroes, like Jaclyn, and lovable oddballs, like Eduard (an eloquently snooty math whiz). Hoover also creates fragile, heart-stopping moments that launch his narrative above the average kids’ adventure. During art class, Oliver is partnered with the know-it-all Ana Rahela to draw each other’s portraits; he draws her with a big mouth and balloon head, while she portrays him as he longs to be seen—without his birthmark. Daringly, the author also gives readers two versions of America to consider: one that celebrates independence and another that poisons its own soil with chemicals. Though Hoover leaves some things unexplained by the end, his narrative is a concert of striking events and complex emotions. A remarkable debut enlivened by heroic portions of silliness, spirit, and depth.